What do you make to this? It was sent to me on Valentine's Day by an old friend from primary school days. In the first attempt I received a corrupted file. The second attempt tonight, I now get to see it as it was. 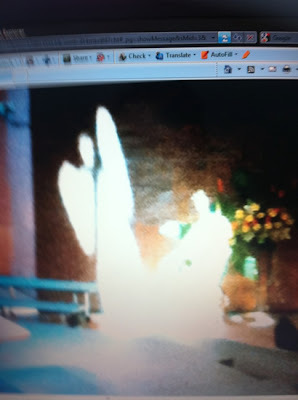 This picture was purportedly taken at Paya Lebar Methodist Church during church service. They recognized it as a picture of angels. It is so natural for us to see things this way and get excited too. I don't think it will ever change. This sort of thing is not for me. Angels or not, it doesn't matter to me. I only hope that much of humanity do not stop here but go on to know the personal Christ. Well most people are just not like that. It is especially obvious among the Catholics. And in Islam, they have long evolved Sufism. It cannot be helped. From an old friend via MMS.